THE DAKOTAS have always been the upland bird hunter’s dream destination as far as pheasants are concerned, and this still holds true today. 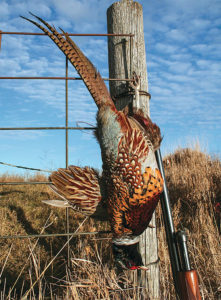 Even in so- called “down” years, like last year, when pheasant population survey data compiled by both the South Dakota Game, Fish and Parks and the North Dakota Game and Fish Department suggested overall bird numbers were down from previous years, those willing to hit the fields were still able to warm up their barrels while chasing roosters. In South Dakota, for example, hunt- ers still bagged an estimated 1.1 mil- lion birds, despite the fact the state’s annual pheasant brood survey released late last summer suggested the overall pheasants per mile index was down 20 percent from 2015 numbers. In North Dakota, the 2016 brood survey suggested the state’s pheasant population dropped roughly 10 percent from 2015. However, hunters were still able to claim nearly a half-million roosters from the Peace Garden State’s pheasant grounds. What does all this mean? Basically, it means there are still plenty of birds in the Dakotas there for the taking, despite less than totally perfect projected population estimates. Every year I host a number of hunt- ers, both fully guided and on a do-it- yourself basis, through my outfitting and guide business near the birthplace of pheasants in Spink County, S.D. Through the years, it has been my observation that the number of pheas- ants across the Dakota landscape gen- erally surpasses the estimates provided by the state, and I know my clients who return year after year would echo these thoughts. I believe the survey findings are often very conservative and under- sell the amazing opportunities still available to pheasant hunters in the Dakotas who are willing to work for their birds. Admittedly, there are subtle nuances between how SDGFP and NDGF run their pheasant survey routes, but the similarities far outweigh their differences. Without getting into too much detail, the most important thing to remember is the surveys are conducted along predetermined routes and provide a brief glimpse of what is observed on a particular day. Recording pheasant brood data from the exact same routes provides a historical look at a specific, defined sample area from one year to the next, but it’s vitally important hunters remember that the counts are limited in their scope and are not indicative of the overall population of pheasants in the Dakotas. Additionally, the surveys rely heavily on weather to help push birds into the open. Both states run their surveys in a short time period between late July and mid-August, and both states require that data be recorded along survey routes early in the morning, just after sunup. We must also take into consideration that crop preferences and farming prac- tices have changed drastically since the turn of the century. Where there once was miles of harvested wheat stubble standing only a few inches high or even bare, worked ground that helped make the birds easier to spot along the routes, we now have a preponderance of row crops that easily conceal a majority of the birds. It now takes them about three steps or one good hop to disappear from the ditches into the dense foliage of corn and beans in late summer when the surveys are run. Typically, a Dakota summer will provide wildlife officials with a few mornings where there is little to no wind and heavy dew, two primary weather conditions that push damp birds, both young and old, into the open to dry off. As a result, they’re simply easier to observe during roadside counts. Last summer, however, ideal mornings where more birds would be searching for sunshine to dry off were few and far between. In other words, the conditions were very poor for counting pheasants, which likely contributed to the down- turn in the survey’s findings. A good example of the dispar- ity between pheasant counts and the actual population can be found when you compare the SDGFP’s 2016 brood survey info from different survey routes in northeastern South Dakota near Aberdeen, a traditional pheasant hunting hotspot about a half-hour north from my home. Each year, SDGFP runs its annual brood survey in the Aber- deen area along 14 routes in Brown, Marshall, Day, Edmunds, Faulk and Spink counties. Across the routes, an average of 1.84 pheasants per mile were observed in 2016, which was down 43 percent from 2015’s average of 3.22 pheasants observed. 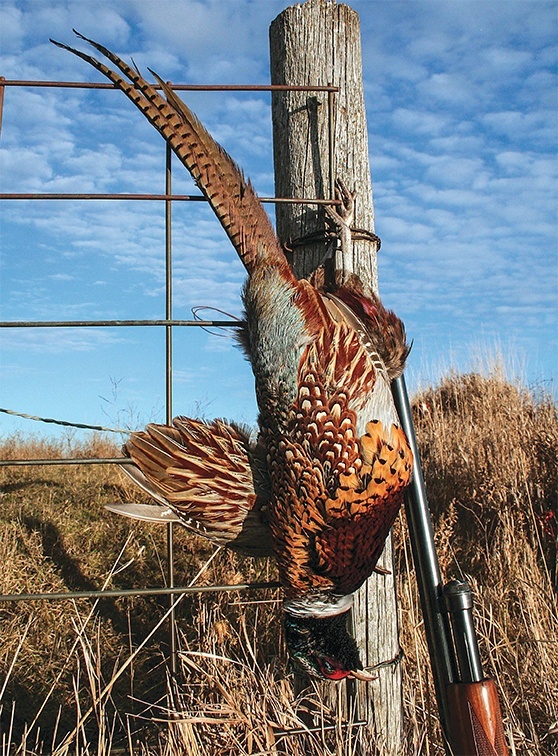 He said a route located in the southern part of Brown County showed a significant decrease from 2015, which led him to believe the area’s actual pheasant population in 2016 was actually much more stable than the numbers indicated, given the fact two of the routes in the same county showed an increase. Evidence of a stronger pheasant population in Brown County was also apparent this spring, according to Aberdeen-based Pheasants Forever Farm Bill Biologist Emmett Lenihan. Prior to the peak pheasant-nesting season, which is mid-May to mid-June in northeastern South Dakota, Lenihan said he was surprised at the number of birds he was seeing in Brown and Day counties. “Going into the nesting season we were looking pretty good — everybody was seeing birds everywhere if there was habitat available,” he said. “Seeing the number of birds around was quite a positive change from where we were three or four years ago. Back then, it was hard to even find a dead pheasant on the road this time of year. So, things are turning around, and maybe we can keep them going in the right direction.” There is no doubt the overall population is not as high as it was a decade ago. But I am of the opinion that too many people don’t keep the larger picture in mind. Simply stated, we have birds, and plenty of them. However, this doesn’t mean a limit of pheasants will be stuck in your grille soon after you cross state lines into the Dakotas. After all, pheasant hunting is a participation sport, and the more you and your dogs are willing to work, the better your results will be. Portions of the Dakotas had a higher- than average snowfall this past winter. The severe conditions put a dent in some localized pheasant populations, so keep that in mind if you’re planning a pheasant hunt. In North Dakota, record snowfall amounts had wildlife officials fearing the worst in certain locations. Despite the harsh conditions, Gross said the pheasant population seemed to rebound heading into spring. He said the traditional pheasant belt in southeastern North Dakota, primar- ily from Jamestown south toward the towns of Oakes, Ellendale and Ashley, didn’t have as harsh of a winter. In addition to a number of federal Waterfowl Production Areas and other public hunting opportunities, southeastern North Dakota also traditionally sees high enrollment in its Private Lands Open to Sports- men (PLOTS) program. Statewide, the program provides about 730,000 acres of walk-in hunting opportunity to hunters on an annual basis. PLOTS acres change yearly, so take care to grab the latest PLOTS guide from a NDGF office or download map sheets from the department website. The maps are also available on mobile devices or via Garmin GPS download. Above-average snowfall hit north- central and northwestern South Dakota, as well, but Runia said the arrival of above-average temps in January and February eased the pressure pheas- ants were feeling. He said that most of South Dakota saw above-average snowfall, but that it was not severe enough to have a major effect on the pheasant population. There is a shift occurring as to where pheasants are flocking in South Dakota. For years, the pheasant triangle of Lyman, Tripp and Gregory counties in the south-central portion of the state held the highest populations and the highest hunter success rates. In fact, harvest totals from those three counties alone are higher than Iowa’s total harvest. While this three-county region, which includes famous pheasant destinations such as Winner, Burke and Gregory, still merits consideration, two river valleys are becoming more and more popular, largely because of the amount of public land they contain. The James River valley, for example, has added walk-in opportunities in the form of the Conservation Reserve Enhancement Program. In South Dakota, CREP lands are open to public hunting and are unique to the James River’s watershed in the eastern half of the state. There are currently more than 110,000 acres are enrolled in the program that can be found stretching from near the North Dakota border north of Aberdeen all the way south to where the “Jim” River meets up with the Missouri River. The Missouri River valley has long been a destination for Canada goose hunters, but with the expansion of row crops pushing farther west, pheasants have moved into the big river valley for good. In addition to public lands owned or managed by the state, Army Corps of Engineers ground that abuts the reservoir system along the river is often untouched by many hunters. If you want an adventure, consider taking a boat up Lake Sharpe, Lake Francis Case or Lake Oahe to hunt the nooks and crannies along the shore. Quite often you’ll have these big tracts of public land all to yourself, as most folks are content to use boats only for fishing. Last, don’t forget the ample oppor- tunity that can be found on the Fort Pierre National Grassland, where there are thousands of acres available to the public-land hunter. Huge flushes of hundreds of pheasants won’t greet you on the grasslands, but with some good dog work and a willingness to walk for miles at a time, hunters will be able to score a limit in a solid day’s work. A successful hunt dictates that you can’t take the birds or their senses for granted. Remember, if you choose to forgo the pen-raised cannon fodder and actually “hunt” roosters of the wild variety, this is a game squarely rigged in their favor. You’re stepping into a world in which a wild bird lives year-round, and you’re playing by their rules. Unfortunately, I see a similar scene play out time and time again each year as truck doors or tailgates slam and dog whistles blow. At the first foreign noise, roosters start trickling out the ends and sides of the field — by foot and feather — with the hunt largely over before it started. To avoid these common mistakes, have a firm game plan that is com- pletely understood by each of your players before even entering the field. Once you arrive, everyone needs to get out of the vehicles as quickly as possible and take their respective places in one smooth and relatively quiet motion. Everything you need, which isn’t much, should be ready to roll before arrival. Coats, vests, gloves and hats need to be on before you step out of the vehicle. Not being ready not only shows a disrespect for the pheasants, but also for hunting partners who often have to wait for slowpokes to go through an entire pre-game routine between each field. Don’t be that guy. Have the courtesy to be sure that you’re always ready to roll.